Edith Grace Wheatley (1888-1970) was a painter, sculptor and lecturer. She was born 26 June 1888 in London, née Wolfe, descendant of the family of General Wolfe. She studied at the Slade School 1906–8 and at the Atelier Colarossi in Paris. She married John Wheatley 1912. Her first one-man exhibition was at the Greatorex Gallery 1933. She worked as Lecturer in Fine Art, University of Cape Town, 1925–37. 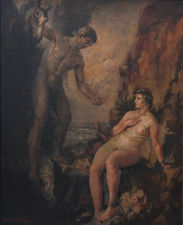 Wheatley carried out ceiling and wall paintings for the Art Gallery and sculpture for the New Law Courts at Cape Town. She returned to England in 1937.